It is really with the two CDs of Artur Pizarro, recorded in the mid-1990s by Collins Classics, 14582 and 14772, and now reissued as a twofer on Piano Classics PCLD0009, that I discovered the piano music of Voříšek and its great beauties (I think it is pronounced Vodjitchek). I had in my collection a recording of some of those pieces played on the fortepiano, and they had failed to make an impact (Olga Tverskaya on Opus 111 OP 30241). Comparing with Pizarro’s reading, I now understand why: it wasn’t just the intrinsic limitations of the instrument, not really suited to the great romantic turbulence of Voříšek’s music – in many ways a missing link between Beethoven and Schubert. But the player, Olga Tverskaya, was simply not up to the music’s demands interpretively, and with her plodding tempos turned it into inconsequential salon music – which it emphatically isn’t, no more than Schubert’s Impromptus or Beethoven’s Piano Sonatas. That the International Music Scores Library Project offers all these scores on download – ten thousand blessings on those who uploaded them – only enhanced my awareness and appreciation of the music’s beauty and significance. 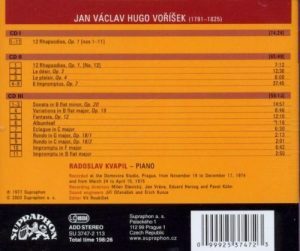 I bought this 3-CD set, recorded in 1974 and 1975 for the Czech label Supraphon by pianist Radoslav Kvapil, to hear an alternative approach and be able to better assess the interpretive merits of Pizarro. The comparison is very (and sadly) conclusive. Start with the 12 Rhapsodies op. 1. Unfortunately you will NOT hear the composer’s genius in these recordings by Kvapil, no more than you would presumably hear the genius of Chopin if you heard his Etudes played by a pianist who couldn’t, or wouldn’t play them up to tempo. The twelve Rhapsodies build a cycle which may be viewed as Voříšek’s Transcendental Studies, that is how Pizarro plays them, and played that way they sound great. Just take the first one, right-hand runs against a left-hand theme in compound-meter chords. With Pizarro it really runs, with Kvapil it plods: he reaches the end of the first section in 2:53 against Pizarro’s 2:17. And the slower, middle section is no improvement (all the Rhapsodies, are couched in a similar, A-B-A form, with a usually contrasting and slower middle section). But when I say “slower”: mind you, here in the first Rhapsody, not by dint of any instruction written by Voříšek to change tempo: but just because he abandons the right-hand runs in 32nd notes, so it is more an impression of a slower tempo through the lengthening of the rhythmic values, than an actual slower tempo. And Pizarro has the good sense to play the section at the same tempo, keeping it animated and full of spring. Kvapil takes it at almost half of Pizarro’s tempo, and it is so leaden as to threaten to loose all shape, and becomes utterly boring. And each time, listening to Kvapil right after Pizarro, my jaw dropped in pained disapproval. At Kvapil’s plodding tempos, down the drain is the joyful, Weber-like exuberance of No. 4 (first section in 2:14, against Pizarro’s 1:50). No. 7 is an extraordinary, Lisztian Etude in broken chords notated “allegro furioso” – Voříšek’s Mephisto-Waltz, as it were; heard after Pizarro (first section taken in 1:54), Kvapil sounds like he is practicing, just to get his fingers in the right place (first section 2:25). The same impression arises from No. 8, another dazzling etude (indicated “veloce, ardito”) anticipating Schumann, played by Pizarro with extraordinary drive (first section 1:10, compared to Kvapil’s 1:25). By what stretch of the imagination could Kvapil think that his plodding tempo in No. 9 was anything near Voříšek’s “Allegro appassionato”, I wonder. Maybe he was trying to monkey Glenn Gould. And at this point it is pointless to go on describing all the shortcomings of Kvapil, the leaden tempos, the digital plodding in the subsequent Rhapsodies: but it’s there. And when come the middle sections, Kvapil resorts, again and again, to the same old trick – slowing down the tempo, becoming elephantine and loosing both the sense of line and the underlying romantic passion and turbulence. The overtones of a Bach Invention or Sinfonia or a Haendel Air that Brahms would want to vary, in the middle section of No. 5, so endearing in Pizarro’s reading, are entirely lost with Kvapil (1:30). Looking at the score, the middle section of No. 8 is emphatically NOT a “slower” one, even on impression: not only does Voříšek indicate no tempo change there, but he writes “con agitazione” – and that’s how Pizarro plays it. Wouldn’t you know? Kvapil slams the breaks, gives it a sense of easy-going bonhomie, and against the composer’s explicit will, looses all sense of agitation. He turns the boisterous ostinato of No. 9 (with Pizarro you’d think you were hearing Offenbach) into salon music for young ladies. Even when he is acceptable, as in No. 2, Kvapil simply doesn’t have the zest, the spirit, the wits, the joie-de-vivre, the nimble fingers of Pizarro (first section of 2 taken respectively in 2:36 and 2:11). You can say that it is another and equally valid interpretive approach, going more for interiority and a sense of nostalgia – but still, something uniquely engaging is lost. Same thing with No. 3: played by Pizarro it is magnificently turbulent, a harbinger of Schumann, really (first section taken in 2:40). If you want to be positive about Kvapil (first section 3:13), you can say that he plays it like a Schubert Impromptu; but heard after Pizarro, he only sounds again like he is practicing just to get his fingers in the right places. Same with the middle section of 11 (3:35), made into a gentle Schubert Impromptu; with Pizarro, it is an agitated Impromptu, in sync with its outer sections, another dazzling and bouncing etude in triplets. Is there anything to salvage from Kvapil’s reading? Oh, well, the outer sections of No. 12 compare not too unfavorably to Pizarro. Who knows, maybe some of those Rhapsodies would have seemed convincing if I had only Kvapil to go by; but heard after Pizarro, Kvapil sounds just tentative, soporific, stiff-fingered, and the sense of irk that it produces is compounded by the feeling of betrayal, the conscience that Kvapil is not giving Voříšek his chance. There is, indeed, some pain involved in the process of hearing such disfigurations of great and unknown music. Kvapil is an un-enjoyable experiment into how to change a magnificent cycle into mediocre, uninteresting music, or simply into how to leave much of the music’s potential buried deep under. To be candid about it, there isn’t one track that I listened to complete with Kvapil: why impose upon oneself such an ordeal? but I did impose upon myself to listen, even if only at samples, to the end. Kvapil’s take on the Impromptus opus 7 is no better. In fact, it starts even worse. The Impromptus are a wonderful cycle, very close to Schubert and sometimes even anticipating Schumann. I couldn’t refrain from a cry of disbelief when I heard his first, right after Pizarro’s. Pizarro plays it with a Schumann-like grace, a lightness of touch. Comes Kvapil: pounding like a little brat in a toy store, crushing the delicate doll to pieces. OK, I’m all for the “alternative view”, but just imagine Schumann’s Träumerei or Prophet Bird played as if they were titled “General Lavine-excentric” (or, to remain in Schumann’s Kinderszenen, “Wichtige Begebenheit”). The other five aren’t as bad, but, despite some effort at observing Voříšek’s articulation marks, Kvapil doesn’t near the subtlety of touch of Pizarro, his variety of colors (Kvapil pounds), and through heavy-handedness and sometimes plodding tempos (as in the middle section of No. 2, or in No. 5, which he plays in a dreadful 9:29 to Pizarro’s 7:31, or again in No. 6), he delivers readings that are charmless, in whole or in part. And you will have no idea of the ineffable beauty of the music-box music in the middle section of No. 4, or of the shimmering harmonies of No. 6, until you hear Pizarro. The same is true with Le Désir, op. 3. Its pendant, Le Plaisir op. 4, would have been almost good, if Kvapil hadn’t again adopted a soporific tempo in the middle section. The magnificent Fantasy fares a little better, and at least the music isn’t distorted beyond recognition, although Pizarro is more accurate in his realization of Voříšek’s articulation and silences and plays with subtlety and variety of touch, and more poetic imagination in the slow section, and, again, infinitely more passionate turbulence in the second one – and a much better piano: Kvapil’s has a tendency not to sustain the chord. Despite the inferior piano, the Sonata would have been better if, in the first movement, Kvapil had sustained his lively opening tempo, instead of taking every excuse to slam the breaks and linger. But, hey, his Scherzo is excellent, although I wish he had observed Voříšek’s silences in the middle trio instead of keeping the sustaining pedal depressed, and while not having the drive and sweep of Pizarro (who plays a slightly different edition), his finale is fine. In the little Variations op. 19, Kvapil’s choices of tempo can be considered more appropriate to the piece than Pizarrro’s, who adopts a basic tempo that is arguably too slow, a true adagio rather than Voříšek’s indicated andante, setting too much store on this rather inconspicuous piece (which doesn’t preclude fine moments of Schubertean grace). Still, Pizarro way compensates through his incomparably greater subtlety and softness of touch – and still greater nimble zest in some of the variations, as the 6th and final. Pizarro’s two discs feature the main compositions of Voříšek. Kvapil adds small pieces. Among those, some (Eglogue, the two Rondos op. 18) are charming but ultimately not so significant; some others are as good as anything written by Voříšek: Albumleaf, the middle section of Impromptu in F (a splendidly Schubertian military/funeral march) and Impromptu in B-flat (but I suspect the latter would make much more impact played by Pizarro at a faster tempo, to make one sorely regret that he didn’t record it). Do these snippets make it worthwhile to buy Kvapil’s 3-CD set, despite the many and deep interpretive shortcomings of his version? Now it is your choice. 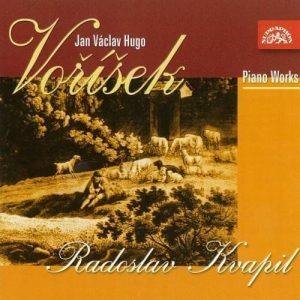 Kvapil re-recorded the Impromptus, Sonata, Variations and Fantasy for Unicorn (“An Anthology of Czech Piano Music” vol. 4, DKPCD 9145 barcode 053068914529), now reissued by Regis, RRC 1224, barcode 5055031312245 . What I hear on this Supraphon set provides no incentive whatsoever to go for it. Voříšek died of tuberculosis in 1825, aged 34, sharing with his friend Schubert a tragically early death. But some composers can be killed twice: once by natural causes, then at the hands of mediocre interpreters. Go to Pizarro and discover the genius of Voříšek.